J.R.R. Tolkien’s The Hobbit turns seventy-five today. I, however, didn’t manage to read it the year it came out. I first became acquainted with the book about twenty-five years ago. My mother, in a fit of nostalgia, bought me a boxed set containing The Hobbit and the three volumes of The Lord of the Rings. She had read The Lord of the Rings in the late 60s when Tolkien-mania was in full swing, and I think she hoped that buying me copies of the books would atone for the fact that she never scrawled “Frodo Lives” on a subway wall. The books were cheap paperbacks, but their covers featured the paintings of Middle-earth by Tolkien himself. (These covers have spoiled me. I can’t stand seeing Tolkien’s books wrapped in the tacky illustrations that are now in vogue for the fantasy genre.) As a ten-year old, I wasn’t a connoisseur of fiction, but I enjoyed them, feeling satisfied that I had read a “good” book. Since that first reading, I’ve returned to The Hobbit again and again. I’ve lost count, but I’ve read the book at least seven or eight times. By contrast, I’ve only read The Lord of the Rings twice. For some reason, the children’s book about Bilbo appeals to me more than the graver book about Frodo. Each time I read The Hobbit, the book is a bit different. The words haven’t changed, but I have. As a child, I think my favorite part was the spiders in Mirkwood, and I desperately wanted to know why the name “attercop” annoyed them so much. At the time, I didn’t like when Bilbo handed over of the Arkenstone to the men and elves. I was confused that he would sellout the dwarves, and I didn’t like to see Thorin cross with Bilbo. As an adult, I think I’m beginning to understand the moral courage that Tolkien communicated in that scene, but I still don’t like to see Thorin cross with Bilbo. In my twenties I reread all of Tolkien, and it left me with a sense of despondency. I realized that I had nothing to say. I tried my best to make all my friends feel despondent as well. Of all the times I’ve read The Hobbit, however, the most meaningful was last year when I read it to my two daughters. Reading out loud made the book much more fun, especially during the poetry and songs. It also made Thorin’s death much, much sadder. Reading out loud that Thorin was the king pierced by spears and laid between two companions was too terrible for me. 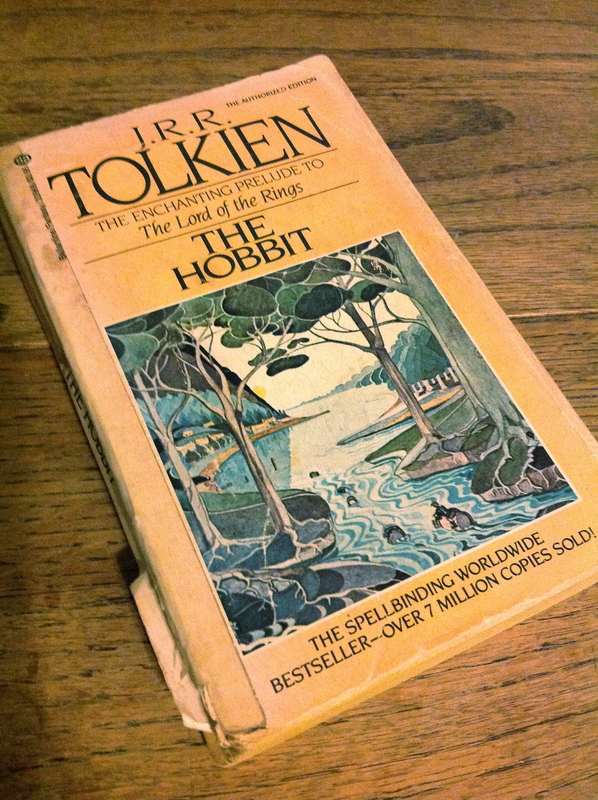 After twenty-five years of reading The Hobbit, it made me cry for the first time. I still have my first copy of The Hobbit. It survived junior high and high school. It’s traveled halfway around the world with me twice. I’ve moved well over a dozen times, and each time it emerges from the box of books a little more tattered. The back cover went missing about ten years ago, but all the pages are present and accounted for. I got a new copy of The Hobbit a couple of years back, and my wife has tried to convince me to throw out the old copy a number of times. I’ve started hiding it in a secret place behind some other books on the shelf. Some things just can’t be parted with. We know we’ll wants it later, my precious. Great read, Dr. Garbarino. I am looking forward to the release of the movie, but I am already disappointed with add-ons that weren’t in the book. Jason, I share your concerns about the “add-ons,” but I’m reserving judgement until I’ve seen the movie. I fear that Peter Jackson will turn The Hobbit into a story for adults instead of the quaint story for children that Tolkien penned. I’m concerned that he’ll turn a bedtime story into an epic, when that clearly wasn’t the intention. But, I still will watch it…. if nothing else for Howard Shore’s music and Martin Freeman as Frodo. I find it touching that you still love The Hobbit as much as you did all those years ago. I’m eighteen, and I hope to love it as much as I do now in the years to come. Zai, I trust you have many rereadings of The Hobbit ahead of you!